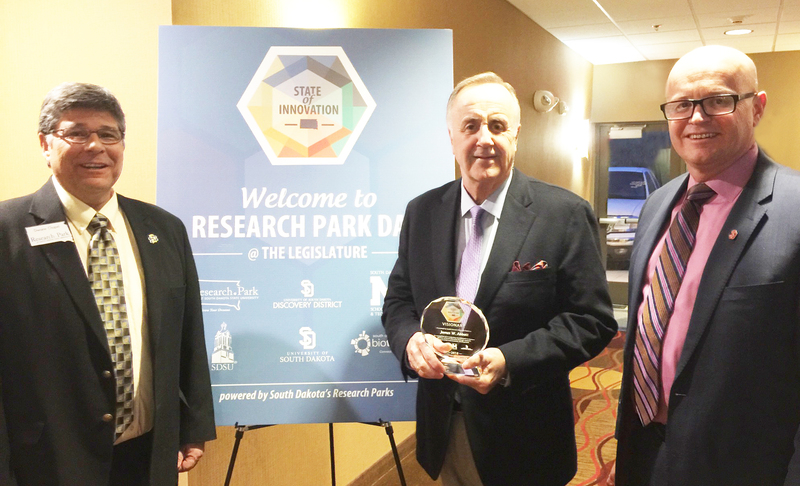 USD President James Abbott was presented the inaugural, “State of Innovation” Visionary Award by South Dakota’s Research Parks. Presenting the award (left to right) Dwaine Chapel, executive director, the Research Park at SDSU, Abbott, and Rich Naser, Jr., president of the USD Discovery District. Supporting key legislation for the incorporation, infrastructure and funding of the USD Discovery District. A lifelong South Dakotan, President Abbott practiced law, was a successful entrepreneur, a respected legislator and in 1997 was named the first USD alumnus to hold the office of president. He will retire from that post as the longest-serving university president in the Board of Regents system. The impact of his ambitious vision and tenacious work ethic are evidenced in record-setting fundraising and enrollment growth, along with USD’s step up to Division 1. South Dakota’s Research Parks are powering a state of innovation by fostering collaboration and partnerships between research institutions, businesses, industries and government since 2004. They bring together key partners to shape South Dakota’s economic future, create opportunities for people and businesses and drive the innovation that impacts the world. These master-planned innovation communities share the common goal of propelling knowledge-based economic development and an innovation-driven economy, resulting in new jobs, increased wealth and enhanced tax revenues. The USD Discovery District is an 80-acre corporate and academic research park under development in northwest Sioux Falls. The District’s goal is to provide access to research facilities and infrastructure for research business development and spur innovation-driven businesses in an environment for students, researchers and entrepreneurs. When fully developed, it will include an estimated 26 privately developed buildings and nearly 2,800 people will work for companies in the District. The Research Park at SDSU was established to create a physical environment that can develop, attract and retain research and technology companies that are aligned to research licensing, intellectual property, innovation and talent with South Dakota State University.